Luxury appartment for 6 persons direct at the beach with a spacious & conditioned 50sqm-livingroom! All rooms with access to two large & exclusive terraces with marvelous seaviews!. • This spacious and modern apartment is located in the residential zone on the exclusive beach in Benidorm Poniente (La Cala). • All four bedrooms, the spacious living and dining room as well as the kitchen have a wonderful sea view and access to one of the two large terraces. • Three of the bedrooms are equipped with very comfortable double beds and the fourth bedroom can be used flexibly, for example, for setting up the own children travel beds. • All rooms have independent air conditioning and a spacious build-in wardrobe. All windows have shutters to darken and integrated mosquito nets. • The two modern and stylish bathrooms have showers and an adjustable underfloor heating. • The fully fitted luxury kitchen with granite countertop has a lot of storage space and includes all the usual electrical appliances as well as an additional beverage fridge. • The spacious and light-filled living and dining room is modern furnished and also equipped with air condition. • The large wooden dining table, where you can sit comfortably with ten people, invites to copious tables and convivial sitting together. • the beach and across the bay of Benidorm. The TV area is equipped with a flat screen TV with satellite channels. • The spacious main terrace is furnished with an elegant patio table and six comfortable rattan chairs. The outdoor seating area can be shaded by an awning. 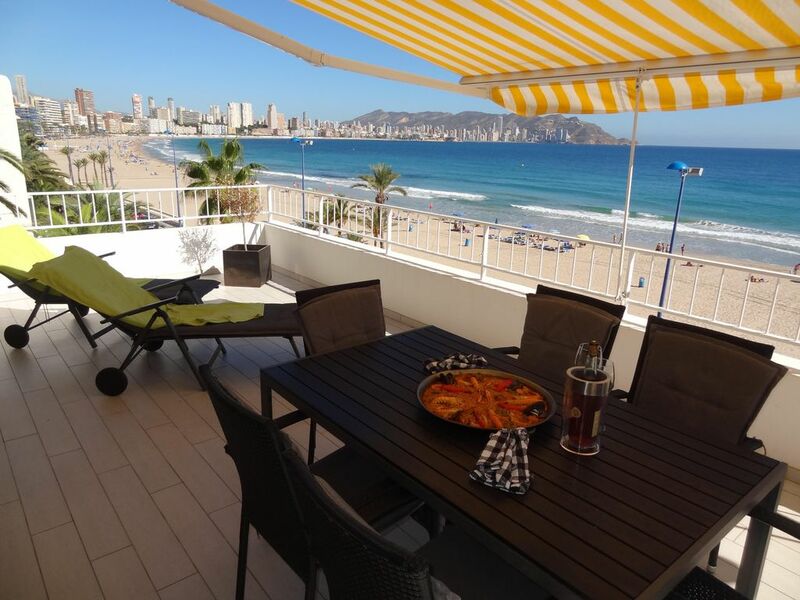 • From the terrace you can watch the hustle and bustle of the beach and the popular beach promenade and the entire bay of Benidorm and its offshore island. • The apartment is located on the third floor of a terrace house situated right on the beach and is reached by a wide stone staircase. • The apartment was completely renovated in 2013 and equipped with modern furnishings. • The apartment has a covered parking place and a lockable garage right on the beach that can be rented separately. • Benidorm, due to its geographic location has a and very pleasant micro climate with over 300 sunny days a year. • the water has a pleasant temperature and is also honored each year with the blue flag for excellent water quality. • Beach chairs and umbrellas can easily be rented on the beach or one uses its own beach furniture, which can be stored in the garage located directly on the beach. • The beautifully designed beach promenade is ideal for long walks. There are a lot of ice cream parlors, beach cafes, restaurants and bars. • and during night you can rest without being disturbed by noises. • Within walking distance you find various shops like small grocery stores, bakeries, pharmacies, magazines and tobacco shops and beach boutiques. • You can reach weekly markets, large supermarkets and shopping centers by bus or car. • Due to its exclusive location right on the beach the offered apartment is suitable for a carefree beach holiday for the whole family. •- jogging, roller blading and cycling. •- painting and dance classes, bingo and movie theaters. •- Explore Spain in its origin with its beautiful lemon, orange and almond plantations, waterfalls and caves. Average overall ratings - Based on 25 reviews.